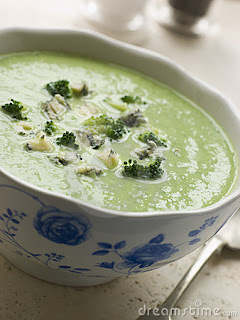 A winter warmer and a great use for broccoli from the garden or bought in if you haven’t grown any. Heat the olive oil or butter and add the onion, broccoli and potato. Cover the pan with a lid or plate and cook on a low heat for about 8 minutes, stirring occasionally and make sure it doesn’t stick (add a little water if needed). Remove from the heat and sprinkle in the flour, stirring as you go to blend. Stir in the chicken or vegetable stock, cover the pan again and simmer very gently for 35 minutes (don’t whatever you do let it boil). Crumble the Stilton and add it to the pan. Add the milk and turn up the heat a little to simmer gently and melt the cheese – about five minutes and don’t let it boil. Add salt and pepper to taste. Warm some bowls then add the cream to the pan mixture, stirring for about ten seconds. If you prefer a smooth soup, whizz it up in a food blender and serve in the warm bowls with a sprig of parsley, croutons (topped with a little Stilton if you wish) or bread to mop up the soup.